The kotel hama’aravi (Western Wall) is not actually the holiest place in Judaism – that is the Temple Mount, the actual site of the First and Second Temples – but for various reasons it has become the holiest place at which it is practical for Jews to pray. It is administered by an organization called The Western Wall Heritage Foundation, chaired by Rabbi Shmuel Rabinovich, “the Rabbi of the Kotel.” It is considered an Orthodox synagogue. In 1988, the Women of the Wall (WoW) organization was founded in order to obtain the right for women to pray at the Kotel with Torah scrolls and wearing a tallit (prayer shawl). They did not ask for mixed prayer with men, just a relaxation of the rules concerning how they could pray with other women in the women’s section of the Kotel. This would not violate Orthodox halacha (religious law), but is in opposition to the rules established by the Rabbi of the Kotel and the customs of strictly observant Jews (among others, the prohibition against women chanting out loud in the presence of men). Customs differ over time and place. While it can be shocking to see a custom that one has grown up with violated – consider the (non-religious) customs concerning gender and restrooms – changes can and do happen. Over the last 50 years, many of the customs followed by normative Orthodox Jews have become significantly more strict. Halacha is a different matter, and changes are made rarely and depend on decisions by widely recognized rabbinical authorities. The women held regular monthly prayer sessions and were faced with opposition from the Kotel management and sometimes verbal or physical assaults by Haredim. The group began a legal struggle to force the Kotel authorities to permit them to pray as they wished, in the existing women’s section. They continued to pray there regularly, and numerous members were arrested for creating disturbances and disobeying police. Meanwhile the American Union for Reform Judaism (URJ) and its junior partners established an organization called the Israel Religious Action Center to promote its goals in Israel. It hired Anat Hoffman, the chairwoman of the Women of the Wall, as its Executive Director. The negotiations and legal processes between the women and the government now include representatives of the Israeli branches of the Reform and Conservative movements, and the objectives of WoW have been correspondingly broadened as a result of its connection with the Reform movement. What had been a movement to permit women to pray with Torah scrolls in the women’s section of the Kotel became a movement to permit mixed-gender prayers, according to Reform and Conservative practice. For four years, representatives of the government and the other involved parties engaged in negotiations under Jewish Agency chairman Natan Sharansky to find an acceptable compromise. Finally, in January of 2016, a deal was made. An area that is currently occupied by an archaeological park at the south end of the Kotel next to Robinson’s arch (see photo above) would be permanently allocated to mixed-gender and other non-Orthodox worship, renovated and made accessible by a single entrance leading to both the new area and the original Kotel plaza. A committee consisting of representatives of the government and “non-Orthodox leaders” would manage the area, which would be outside of the jurisdiction of the Rabbi of the Kotel. Hoffman, who had previously vehemently opposed the idea of a prayer area at Robinson’s Arch (she had called it “the back of the bus”) suddenly supported it. 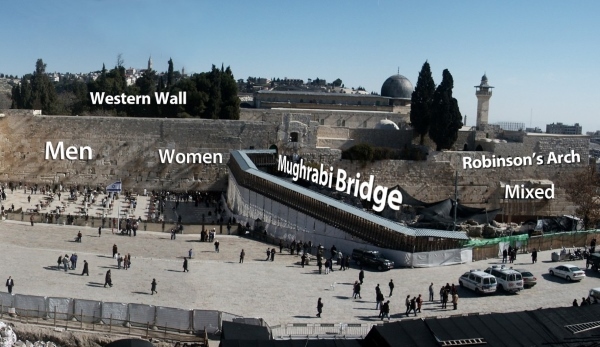 The Board of Directors of the Women of the Wall voted to move their services to this area when work would be completed, to the unhappiness of some of its more conservative members who felt that the original goals of the movement had been “betrayed.” The URJ put its full weight behind the compromise, because it represents an implicit recognition of the legitimacy of non-Orthodox Judaism by the state of Israel. But the compromise was never implemented for precisely this reason. Although the Haredi parties that are part of the ruling coalition initially agreed (albeit reluctantly) to the compromise, Haredi media exploded with criticism, making sure that the implications of such an agreement with the despised reformim were widely known. The pressure on the Haredi parties was irresistible. They withdrew their support, and even threatened to leave the coalition and precipitate new elections if the compromise went ahead. On Sunday the cabinet voted with only two opposed (Defense Minister Avigdor Lieberman and Energy Minister Yuval Steinitz) to “indefinitely freeze” the implementation of the compromise. Construction on the improvements to the Robinson’s Arch area would continue, and it will continue to be available for non-Orthodox worship; but there will be no handing over of authority over any part of the Kotel to a body containing non-Orthodox representatives. So the demands of a few women for a small change in the rules concerning their Orthodox worship morphed into a challenge by the URJ, the standard-bearer of non-Orthodox Judaism, to the religious establishment and the government of Israel, to accept it as a legitimate partner. And this will never be acceptable to the Haredi parties. URJ leadership in the US is furious, but it’s reasonable to ask them “what did you expect?” The overwhelming opinion of Jewish Israelis – not just Haredi, or even religious ones – is that Reform Judaism is not Judaism. And they are asking the Haredim to sit down with them as equals! They would as soon drive to the beach on Shabbat to barbecue pork cheeseburgers. Prime Minister Netanyahu’s decision to say ‘no’ to his previous ‘yes’ is an unconscionable insult to the majority of world Jewry. We are assessing all next steps. The Israeli Supreme Court will rule, but even in waiting for the court we will not be still or silent. The stranglehold that the Chief Rabbinate and the ultra-Orthodox parties have on Israel and the enfranchisement of the majority of Jews in Israel and the world must—and will—be ended. Jacobs’ arrogance and presumption to pontificate about what Israel must do perhaps obscures the false assumption he makes about the “majority of Jews in Israel and the world.” Even the most secular Israelis don’t agree that American Reform Jews should decide what Israel does in the holy places that were regained with the blood of its soldiers. They may passionately hate the Rabbinate, but it is our Rabbinate that they hate. Netanyahu’s position is clear. On one side there is a tiny minority of voters (no more than 8% of Israeli Jews identify with non-Orthodox Judaism) and only a handful view the WoW as anything more than a curiosity. Most Israelis either don’t care what kind of worship at the Kotel is permitted, or support the Orthodox position. The URJ in the US may threaten to withhold financial and political support, but in recent years most of this has gone to Netanyahu’s political opponents, and even to anti-Zionist groups like J Street and the New Israel Fund – organizations in which Jacobs himself was active before he became URJ President. There is absolutely no percentage in it for Netanyahu to try to face down the Haredi parties in order to make Jacobs happy. What will happen next? The Supreme Court will weigh in, and probably a new compromise will be worked out. The Haredi parties will not give in to anything that they see as legitimizing Reform Judaism, but mixed-gender prayer will probably continue to take place at the Robinson’s arch location. The original WoW who want to pray in the women’s section with Torah scrolls and tallesim will probably be out of luck. Rick Jacobs will continue to blame Netanyahu for everything, and continue to do his best to undermine Israel’s democratically elected government (because he understands democracy better than we do). Who has lost out here are the women who had a reasonable demand, one that many Orthodox rabbis agree does not violate halacha. They might have gotten what they wanted if they had not chosen to ally themselves with an 800-pound left-wing gorilla with ulterior motives, the URJ. This entry was posted in American Jews, Israeli Politics, Israeli Society. Bookmark the permalink. You have a point but you are missing another one. This is another imposition by the Haredi minority on the Israeli public and the Jewish world as a whole. Yossi Klein Halevi makes the point the point that Zionism is about Israel belonging to the whole of the Jewish people, not just the Haredim and not just the religious either. The Kotel is also a symbol for secular Jews and for many of them has meaning. It is also important to note that the Prime Minister broke his promise. Jacobs and Reform Jews are not the whole of the non- Haredi world. Klein points out a parallel between this action and the Haredi torpedoing the compromise made on Conversion by the late Yaakov Ne’eman which would have enabled a few hundred thousand people to move deeper into belonging to Israel and the Jewish people. Absolutely correct. I didn’t write about it but the latest proposal to invalidate non-Rabbinut conversions is also atrocious. And there is also an attempt to eliminate public transit on Shabbat in several places. And the behavior of some Haredim toward soldiers is … no words. 1. Jacobs and his organization insert themselves inappropriately into Israeli affairs, and their motives are often political (to embarrass Bibi and bring about a change of government). 2. Asking the Haredim to recognize Reform Judaism as a legitimate form of Judaism is like asking them to accept the authority of the Pope. It is never going to happen, and a workable compromise can’t include this. I am neither haredi, nor Israeli. But I am a Zionist and a Jew. The basis of this problem is the “jewishness” (or lack thereof) of the Reform Movement. It is my absolute belief that the Reform Movement cut its last tie with Judaism almost 50 years ago. As such, it has no authority to dictate anything to those who believe in traditional Judaism. It is a leftist political movement that has no place in modern Judaism or the State of Israel. Let Rick Jacobs “thunder” all he wants. He is nothing but another Korach.